Genesis Chakan: The Forever Man (USA) in 17:39.38 by slash_star_dash. This movie here is one that makes little to no sense to someone who isn't familiar with the game. 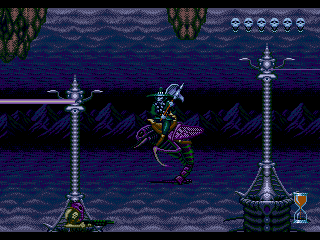 The main character can move very fast and the dark graphics don't help in figuring out what's going on. There is a lot more going on in this movie than meets the eye. For example, the player uses a secret warp involving combining the alchemy potions that are scattered throughout the levels. For more information about what's going on in this game, we recommend reading the author's comments at the submission page. NOTE: Don't be fooled by the fake credits after the final level. The game is not quite over yet.